Color: Stipe perfect for: Dog, cat, rabbit duck, little pig ,etc.. We always offer your favorite dog carriers for small dogs and medium dogs. Don't put the pets which over 22ibs.These reversible sling dog carriers are the perfect combination of convenience and style. It is designed to take your pet travelling with you. It is a flat when not being used, so it is convenient to place and use little space. Material: Cotton, polyester machine wash in cold water on a gentle cycle. Package include: 1 pet sling carrier bag. 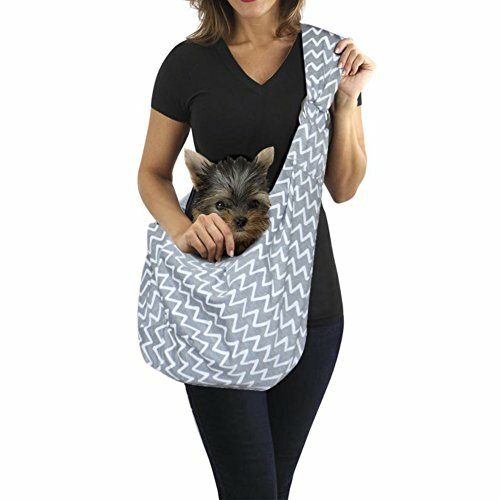 HANDS-FREE: This reversible and hands-free sling-style carrier loops over shoulder while the pet rests in the pouch on the opposite hip to keep pet secure and comfortable. These are your perfect dog carries for small dogs and medium dogs. COMFORTABLE MATERIAL: This carrier bag is made of machine washable soft cotton fabric. Soft and comfortable. Keep you and your pet relaxable and comfortable throughout the day. SAFETY ENOUGH: This pet carrier bag holds your pet easily and it features a safety collar hook to ensure your pet is safe and secure, with external security to prevent pets jumping out. MACHINE WASHABLE: Make your pet sling bag look and feel like new with a simple cold wash in your washing machine. Size:L*W 25.6*12.6 IN Double-sided usable design holds pets up to 15lbs for daily walk and weekend adventure. If you have any questions about this product by Tacobear, contact us by completing and submitting the form below. If you are looking for a specif part number, please include it with your message.